In Canada, Dimitri Lascaris called on B’Nai Brith to disavow a white supremacist who called for Trudeau’s execution. He then found himself accused of being an anti-Semite. Dimitri Lascaris is a lawyer, journalist, and activist. After working in the New York and Paris offices of a major Wall Street law firm, Dimitri became a class action lawyer in Canada. His practice focused on shareholder rights, environmental wrongs, and human rights. In 2012, Canadian Lawyer Magazine named him one of the 25 most influential lawyers in Canada, and in 2013, Canadian Business Magazine named him one of the 50 most influential persons in Canadian business. Dimitri ran as a Green Party candidate in Canada’s 2015 federal election and has served as the Justice Critic in the Green Party of Canada’s shadow cabinet. MARC STEINER: Welcome to The Real News Network. I’m Marc Steiner. It’s great having you with us. Real News contributor and board member Dimitri Lascaris was accused and publicly attacked in Canada as an anti-Semite. It all stemmed from his tweet to two Jewish Liberal Party members of parliament, asking them to denounce a vicious video posted by two women who supported a counter demonstration organized by the Jewish Defense League in support of the B’nai B’rith, who opposed a pro-BDS demonstration that was supported by the Postal Workers Union of Canada. The video called for bringing back the death penalty, and the execution of Prime Minister Trudeau and other political leaders who are either Muslim, or are of East Indian descent. The parliamentarians did not answer his tweets. Then he was denounced by Prime Minister Trudeau for being anti-Semitic. This episode is on the heels of a battle taking place in the British Labour Party, where its leader Jeremy Corbyn is being accused of being an anti-Semite, and the raging debate over the new international definitions of anti-Semitism. Dimitri Lascaris now joins us from Canada, here as a guest of ours. Hi, Dimitri. Good to have you with us. DIMITRI LASCARIS: Great to be here, Marc. Thank you. MARC STEINER: So let’s go back to that demonstration. And what took place that day. Why, first, why did the postal workers call the demonstration in support of BDS? Talk about the root of that. And then I want to play a short clip of the women that you wrote about in that tweet. But take us back to that day. Why the demonstration? DIMITRI LASCARIS: So a few weeks- a few weeks before the demonstration, which happened at the head office of B’nai B’rith in Toronto, B’nai B’rith issued a scathing attack on the Canadian Postal Workers Union, really a very progressive, cutting-edge union in Canada in so many respects, because they have- I mean, they didn’t say this, but this is a union that has openly supported the BDS movement. And the particular basis of the attack in that case was that they had expressed solidarity with the Palestinian Postal Services Workers Union. And somebody had posted on the Facebook page of that union an article or a comment that was supportive of someone alleged, but not proven by the Israeli authorities, to have committed a terrorist attack. And this person, a young Palestinian living in the West Bank, had been killed by Israeli soldiers. There had never been an independent judicial determination that he had actually been guilty of what was alleged against him. But he was killed. And so they expressed support for him, and immediately B’nai B’rith pounced on this and said that the Canadian Union of Postal Workers had aligned itself with a pro-terrorist union in Palestine. And we in the Palestinian Solidarity Movement here in Canada, which includes many progressive members of the Jewish community, saw that as a transparent attempt to vilify the Canadian Union of Postal Workers because of its support for BDS. So we called for this protest in support of the Canadian Union of Postal Workers on August 29 in Toronto. MARC STEINER: Question. Is it odd for a Canadian labor union to come out publicly like this in support of the Palestinians, or other international issues? Is that a rarity? DIMITRI LASCARIS: No. I mean, there have been unions in Quebec that have expressed support for the Palestinian people. Unifor, I’m pretty sure, the largest private sector union in Canada, has expressed support for the Palestinian people. MARC STEINER: And Unifor is who? DIMITRI LASCARIS: Unifor, it’s- frankly, I can’t tell you what the [inaudible] but I do know that it is the largest private sector union in Canada. DIMITRI LASCARIS: And this is quite common amongst the labor movement in Canada for there to be expressions of support for the Palestinian cause, for freedom and human rights. MARC STEINER: And you were at the demonstration yourself, correct? DIMITRI LASCARIS: I was actually one of the organizers. 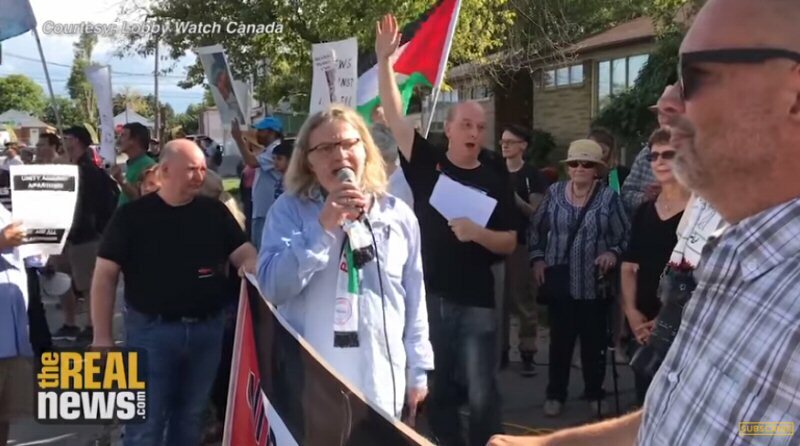 And before, in advance of the demonstration, we were attacked quite stridently by B’nai B’rith, by the Center for Israel and Jewish Affairs, which is probably the most prolific lobby group in Canada in terms of advancing the governments of Israel’s agenda. We were attacked also by Michael Leavitt, one of the two Liberal MPs who you mentioned, who was the head of the Canada-Israel Parliamentary Committee, and is the MP in that particular riding where B’nai B’rith’s head office is situated. Now, you mention this video, and I know you want to go there in a moment. But something else happened before we get that video which I think is very important [inaudible]. At the end of that rally, a person by the name of Faith Goldy showed up. Faith Goldy is running for mayor of Toronto. Faith Goldy is a brazen white supremacist, and in fact, months ago she actually promoted a book on the Internet by a Romanian fascist that openly called for the elimination of the “Jewish menace.” In addition, during the summer, this past summer, she promoted and complimented a neo-Nazi party in Greece called Golden Dawn, which is arguably the most virulent and dangerous neo-Nazi party and blatantly anti-Semitic party, and held them up as an example of a party that ought to be emulated. So she showed up at this rally. And she was warmly received by the B’nai B’rith supporters who had gathered on the other side of the sidewalk, and were hurling obscenities at us and anti Arab racism at us, and Islamophobic commentary at us. And in particular, the head of the Jewish Defense League himself, Meir Weinstein, you know, just basically embracd her as an ally at that rally. So when it was all over, you know, we were again, both before and after, we were attacked by Michael Leavitt, the MP I mentioned. We were attacked by B’nai B’rith. We were attacked by the Center for Israel and Jewish Affairs, said it was outraged by our protest. But not a word, not a single word was spoken about Faith Goldy or this video that you’re about to talk about. MARC STEINER: Let’s go to this video. The women in this video were at the demonstration. They were part of the counter demonstration. In another piece of this video if we have the time we’ll play, they support Faith Goldy, and come out and talk about how they support Faith Goldy and are going to work for her in Toronto. She’s running for mayor. And kind of ridiculed in some racist ways other people who are running for office in Toronto. And then they posited this, which has to do with asking for the execution of Trudeau and others who are members of parliament. VIDEO: I just think that we should bring in the death penalty. And that would resolve a lot of problems, and it would discourage people from committing these crimes. And then we’re done. And that’s it. And we don’t really need. Start with some of our politicians. Yeah. Wouldn’t that be great? Guilty. Traitor. Justin Trudeau. Be the first one to go. I’d love to see him. And Monsef, and Iqra Khalid, and Ahmed Hussen, and Omar Alghabra. Oh my god, I can’t stop naming them all. Can you name some more? Can you help me? Deportation or the death penalty. We’ll give you your choice. And sing. Sing, also. Let’s make him sing, you know, as he walks towards the guillotine. Off with his head. The guillotine is quite humane, right? It’s quite instant. And for your last words, [makes guillotine sound]. MARC STEINER: So let’s talk a bit about this. I mean, this is the, this video is what inspired you to tweet to the two members of parliament, members of Liberal Party, which is Trudeau’s party, who are Jewish and Zionist, saying that they should they should distance themselves from what these two women have said. Is that how that took place? DIMITRI LASCARIS: The video, which not only called for the death penalty to be imposed upon the Prime Minister and certain liberal colleagues in the caucus, and NDP leader Jagmeet Singh, but which also contained blatant anti-Arab commentary, and the appearance of Faith Goldy, that prompted me to call upon these two MPs, not because of their ethnicity, has nothing to do with it. Is because of their outspoken defense of the state of Israel, which I could spend quite some time talking about. And the fact, in particular, that Michael Leavitt had condemned us both before and after the rally without mentioning them. I not only called upon those two MPs, by the way. I called upon B’nai B’rith and the Center for Israel and Jewish Affairs to condemn them. And not one of them said anything critical about Faith Goldy, about this death wish, about the anti-Arab and Islamophobic commentary of the pro-B’nai B’rith protesters. This went on for days of- there was days of silence. And finally this prompted me to say on Twitter it appears that these two liberal MPs are more devoted to the state, to Israel’s apartheid regime, than they are to their own prime minister and their Liberal colleagues, because they remained silent in the face of these heinous threats. And you know, I basically ask myself this question mark. What would have happened if those threats had been uttered, that death wish, had it been uttered by a supporter of Palestinian rights? I have absolutely no doubt, especially one who had attended the rally, the [inaudible] rally. I have absolutely no doubt that both those MPs and those two organizations would have unhesitatingly branded that person as a terrorist. But when that kind of awful, heinous language and threatening language is employed by somebody who’s a supporter of B’nai B’rith and of Israel, they’re shamefully silent. And I thought that was something that that merited criticism and commentary. MARC STEINER: And this has kind of become a huge news item in Canada, from what I’ve been reading. I mean, people are talking about it all over the place. Because Trudeau- you asked for them to distance themselves. It was Trudeau who wrote a response to you that we’re seeing on the screen now, tweeting, saying what you did was anti-Semitic. DIMITRI LASCARIS: Right. And that was preceded- what happened was the day after I made the tweet, the Center for Israel and Jewish Affairs sent- and this was shared to me by people who work on Parliament Hill- they sent a missive out to the people who work on the Hill, not to the general public, in which they called for me to be condemned as an anti-Semite. And in their public commentary and in their communications with the parliamentarians, the Center for Israel and Jewish Affairs left out an absolutely critical aspect of the International Holocaust Remembrance Alliance definition of anti-Semitism. And that is, that definition of anti-Semitism- which is controversial. Many people view it as being too broad and as a weapon to silence criticism of Israel. But let’s take it at face value and say that it’s a reasonable definition. It has a series of examples of anti-Semitism. And before it talks about those examples, before it lists them, it says that the following could constitute anti-Semitism, depending upon the entire context in which they are they are articulated. These examples are the statements articulated. So in calling upon parliamentarians and leading politicians in Canada to denounce me, the Center for Israel and Jewish Affairs left out this really important qualifying language, and made it sound as though any time anybody questions where the priorities of a politician happens to be Jewish lie, that constitutes anti-Semitism. But that is not what the IHRA definition says. What it essentially says is it all depends on the context. MARC STEINER: So have you- a couple of things here I think are really important to explore. First of all, the question is have you heard any more from Trudeau’s office, or anybody else? B’nai B’rith, the parliamentarians, from anybody? DIMITRI LASCARIS: Well, there was a, within a 24-hour period following the demand by the Center for Israel and Jewish Affairs that I denounced, there was a torrent of criticism coming at me from various parliamentarians, including the leader not only of the Liberal Party, but also the Conservative Party, and of the NDP. And then following that, I didn’t hear any commentary from politicians, but I continued to be attacked by the Center for Israel and Jewish Affairs and B’nai B’rith. And they’re basically calling for me to be boycotted by politicians on the Hill. They’re calling for me- there’s a strange irony to all of this, because I am a supporter of the boycott, divestment, and sanctions movement. But they’re calling for politicians in Canada basically to have nothing to do with me. MARC STEINER: So even the NDP, the New Democratic Party, which is the left-leaning party in Canada, which is having its own internal issues over who should be the leader and one who has said things that are pro-Palestinian. So there’s contradictions going on inside there, as well. I was kind of shocked when I saw the entire spectrum of Canadian political life kind of attacking you and coming after you. DIMITRI LASCARIS: Well, I think we need to be a little bit sanguine about what the NDP really stands for when it comes to Palestinian rights. It is true that of the three major political parties in Canada, the rhetoric coming out of the NDP with respect to Palestinian rights is the most, I think, humane and fair-minded. But a few months ago there was a convention in Ottawa organized by the NDP. It was the first convention for the new leader Jagmeet Singh. And the NDP youth, supported by riding associations from across Canada, brought forward a very modest resolution or the Palestinian rights. All it called for was a ban on the importation of products from Israel’s settlements, which are acknowledged by the Canadian government to be a violation of the Fourth Geneva Convention. It’s a very modest sanction. Not only was this resolution opposed by Jagmeet Singh and by the Foreign Affairs critic Helene Laverdiere, who also came after me on Twitter, but in addition they used underhanded and antidemocratic tactics to stifle debate on the resolution. So they wouldn’t even allow the resolution to be talked about at the convention. So there is a vast disparity between the rhetoric of the leadership of the NDP, the supposedly progressive party, and the actual reality of how it approaches the issue of Palestinian rights. It will not do what is absolutely essential to securing justice and freedom for the Palestinian people, which is to call for some form of meaningful economic sanction on the state of Israel. MARC STEINER: So I mean, there are a couple of issues here that really kind of scream for a conversation, they really stood out to me as I was reading all the stuff that was going on, reading their tweets, watching the video of these two women who were clearly so far to the right, I mean, it was just kind of, seemed a little tipsy and vile the same time. But it’s A, what this exposed, it seems to me, is the debate that’s also going on all over the Western world inside the Jewish community, that is splitting the Jewish community open. Which is one of the reasons that I think the you’re seeing so many people in so many established organizations like the United States and their counterparts in Canada, and the present Israeli government, kind of teaming up with people they would never have talked to before who were anti-Semitic, racist, white supremacists. But now they’re making this dialogue because so many Jews were kind of saying, no, this is wrong. We can’t keep doing what we’re doing in terms of the West Bank and Gaza and Palestinian land that’s taking place. And I think that that’s part of the undertone here that’s not being spoken about, but it’s at play in what happened to you. DIMITRI LASCARIS: I think that’s absolutely correct. I mean, I think, I think that the right and the proto-fascist and fascist movements which are burgeoning in the West- and it’s an extraordinarily alarming trend that should concern us all- they see Israel, whatever feelings they have about the Jewish people, and almost uniformly they’re hostile to the Jewish people and in some cases they exhibit outright hatred towards the Jewish people. But they see the state of Israel this hyper-militarized and racist state as being a model that they can emulate, or ought to emulate, in their own countries. And I think they also share something with the Israeli government in terms of substantive policy, and that is a virulent hatred of Muslims and Arabs. And so there is a marriage of convenience going on between fascist and proto-fascist groups and Western and other countries and the racist apartheid regime of Israel. And I think we saw this on blatant display at this protest in Toronto. We saw the merger of fascist, anti-Semitic groups with pro-Israel groups. And it’s something that should be extraordinarily alarming to us all, as I said at the outset. And you know, I think- a story that The Real News has covered in the last few months, Max Blumenthal did some excellent work in this regard, is that the Israeli government has been selling weapons to the regime in Ukraine even though there are very significant neo-Nazi, anti-Semitic elements within the Ukrainian military. And evidence emerged thanks to Max Blumenthal’s reporting and that of Asa Winstanley at the Electronic Intifada, that Israeli weapons were ending up in the hands of the Azov Battalion, a neo-Nazi, anti-Semitic force within the Ukrainian military that is increasingly influential in Ukraine, and in Israel itself. Human rights activists have brought legal proceedings to stop the sale of weapons to the Ukraine because of the presence of neo-Nazis and anti-Semitism within the Ukrainian military. So it is quite extraordinary what we see happening here. I think it’s very telling about the nature of the Israeli government today. And I raise that because we talked a bit about this last week when we talked about doing this program together today. And you know, for many Jews reading that, whether they are progressive, liberal, radical left, or to the right, whoever they may be, it kind of- something viscerally happens to people when they hear that, because it’s like a trope that’s been used for centuries to say the Jews have divided loyalties, now go get them. DIMITRI LASCARIS: And I readily acknowledge that, Marc. I think that the sensitivity of a lot of members of the Jewish community to that type of critique is entirely justified because of the historic experience that they’ve had, because of the horrors that were inflicted upon the Jewish people, because of the ways in which the Jewish people were demonized. But I think also we have to be mindful of the fact that this is a phenomenon, the phenomenon of conflict of interest, divided loyalties, however you term it, that is present in politics in many different ways. There was a 2006 Pew survey of Christians in 13 countries that found that 42 percent of U.S. respondents saw themselves as Christians first and Americans second. And a lot of these Christians in the United States, or people who profess to be Christian, of course, espouse values which could easily be argued to be antithetical to Christianity, just as one could very compellingly argue that Zionists, the Zionist agenda, is antithetical to the values of Judaism. But the bottom line is that these types of conflicts of interest are found throughout the political elites. They’re by no means confined to members of the Jewish community. And when we find them, and when there is a legitimate argument to be made on the basis of a politician’s record that they would prioritize the interests of Israel over the interests of the country on whose behalf they serve as a politician, we should be able to have a conversation, a calm conversation about where that politician’s priorities actually lie, having due regard to the sensitivities of the Jewish community to this type of an accusation. As I said at the outset, my critique of these two politicians has everything to do with their record, nothing to do with their ethnicity and religion. And I’ll just give you one example in which I thought this conflict of interest was on blatant display, and it was only three months ago. The the Israeli military shot a Canadian doctor, Tarek Loubani, in Gaza while he was wearing medical garb, shot him in both legs, in circumstances where there was no conceivable justification for the shooting of the doctor. The Justin Trudeau government, within a matter of days, under intense pressure to act, issued for the first time in its tenure a very critical statement of the government of Israel. And Anthony Housefather and Michael Leavitt, the two MPs to whom I directed this tweet, not only refrained from criticizing the state of Israel, but actually expressed their disappointment in their own prime minister for calling on the Israeli government to hold the people who shot Dr. Terek Loubani accountable, and to conduct an independent investigation. If that is not some evidence at least that these two politicians will choose the interests of the state of Israel over those of Canada when they are put to a choice, I don’t know what is. And as I say, that’s just one example. MARC STEINER: So we have to conclude, but I just want to conclude this way for everybody before we say good evening to Dimitri Lascaris, is that we are producing this, actually by accident because of the conditions of when this happened, on the eve of Yom Kippur, which is the holiest day in the Jewish calendar. It’s a day of atonement, a day when we as Jews fast, which I intend to do all day Wednesday, and contemplate what the world means and what my life means, which is why many Jews do on this day of Yom Kippur, if they’re not in synagogue. And I want to say this because it’s important to think about what just happened here, that we have an Israeli government who wants to consort with anti-Semites and Nazis, and accuse other people of being anti-Semitic. And we should really spend some time reflecting on what that means, and what kind of world we want to build, and what all of this is saying to us in a larger sense that’s happening here, Canada, and across the globe. And we really have to wrestle with this in a very deep way. And I want to thank Dimitri Lascaris for joining us today. It’s always good to talk to you. Thank you so much for being a guest today on Real News. DIMITRI LASCARIS: Thank you, Marc. Thank you for having me. MARC STEINER: And I’m Marc Steiner here for The Real News Network. Thank you for joining us. We look forward to talking to you again really soon. Take care.